Alongside Walter Gropius, Bruno Taut, Mies van der Rohe and Peter Behrens, Hans Poelzig (1869–1936) was undoubtedly one of the most important German architects of the first half of the 20th century. His life and work are inextricably connected to Berlin where he was born, studied, lived with his wife, Marlene Moeschke, in Westend, taught at the Charlottenburg Technical High School, ran his architectural practice and designed masterly buildings such as the Großes Schauspielhaus in Mitte, the Rundfunkhaus in Charlottenburg and the Babylon cinema. As well as these well-known projects, a range of Poelzig’s sketches from his early ornamental studies with floral motifs to his powerful expressionist hand drawings in charcoal and pastel, will also be on show. The exhibition is a cooperation with the Architecture Museum of the Technical University of Berlin and presents 35 of the architect’s realised as well as unbuilt projects for the German capital. This exhibition was kindly supported by speech, Guardian Glass and FSB. Media partner: domus. The exhibition presents a variety of sketchbook and sketch practices by architects whose built work has been largely formed through drawing by hand on paper. 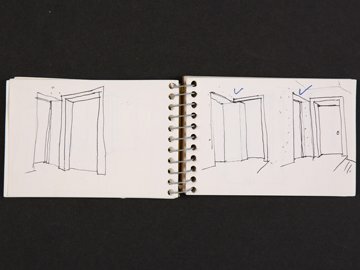 In parallel, it explores the parameters of displaying sketchbooks, considering how an object designed to be held and leafed through can be presented within the requirements of a museum setting. The project therefore considers the content and materiality of sketchbooks both within an architect’s oeuvre, and in the context of institutional display. The sketchbooks represented are the work of Hans Poelzig, Le Corbusier, Alberto Ponis, Adolfo Natalini/Superstudio, Álvaro Siza, Tony Fretton, Marie-José Van Hee, Peter Märkli, Níall McLaughlin and Riet Eeckhout. The sketchbook practices range from impromptu sketches in a pocket-sized format to the transformation of the sketchbook on the drawing board, and from the systematic sketching of details in numbered volumes to the complete replacement of the bound book by a simple folded sheet carried on site. The exhibition is accompanied by monographic publications on the sketch practices of Alvaro Siza, Adolfo Natalini, Tony Fretton and Niall McLaughlin. This new temporary loan exhibition is the third collaborative project between the Museum for Architectural Drawing, Berlin and Sir John Soane’s Museum, London. The exhibition showcases a series of remarkable drawings produced by Sir John Soane to illustrate his lectures at the Royal Academy of Arts, London between 1809 and 1820. 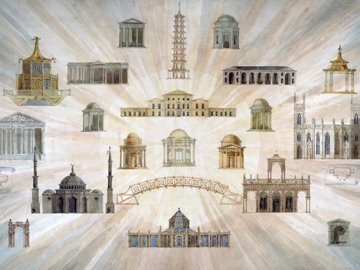 Beautifully rendered by Soane’s pupils from his own office and spanning subjects ranging from pre-history to the latest buildings of Regency London, these coloured illustrations offer a fascinating insight into Soane’s architectural mind and his role as an educator. The lecture drawings, which number over 1,000, were produced by Soane’s pupils in his office working up to 12 hours a day. Some drawings took as long as several weeks to complete. This time-consuming and costly exercise reflected Soane’s commitment to the education of aspiring architects. This commitment was also one of the driving forces behind Soane’s creation of his extraordinary house-museum in London, which he conceived to act as ‘academy of architecture’ for the benefit of ‘amateurs and students’ alike. The exhibition shows 27 of Soane’s most beautiful and important lecture illustrations. It was first shown at the Sir John Soane’s Museum in 2007 and is now coming to Berlin in a revised form. Centrifugal Tendencies. Tallinn – Moscow – Novosibirsk is the continuation in a series of exhibitions centred on visionary and socio-critical architecture in the Museum for Architectural Drawing. 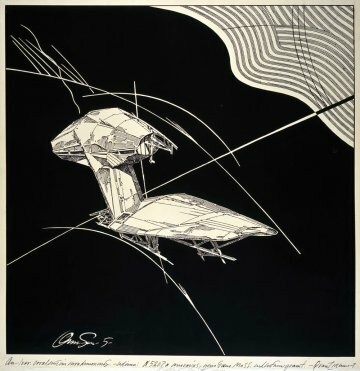 Following the works of Lebbeus Woods, Peter Cook and drawings from Alvin Boyarsky’s collection, this exhibition presents so-called ‘Paper Architecture’ from the former Soviet Union. The term ‘Paper Architecture’ was coined in the 1980s by architect, curator and one of its protagonists, Yuri Avvakumov. It is often used as a synonym for unrealised building proposals, intended solely for the plan chest - yet to stop here would not do justice to the phenomenon. ‘Paper Architecture’ is mainly used to identify an architectural movement born in the Soviet Union of the 1980s, developed in protest against the routine of state planning offices of the time. 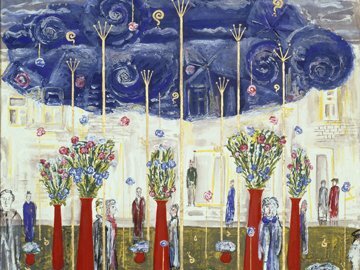 The exhibition presents around fifty drawings which can be grouped into three categories: the Tallinn School, Paper Architecture from Moscow and that from Novosibirsk. It includes works by renowned artists such as Leonhard Lapin, Yuri Avvakumov, Alexander Brodsky and other architects. This exhibition was kindly supported by speech, Guardian Industies and Grohe. Media partner: kulturradio vom rbb. The exhibition at the Cabinet des dessins Jean Bonna of École des Beaux-Arts Paris shows drawings by Russian architects from the collections of the Museum of Architectural Drawing and that of his founder, Sergei Tchoban. The exhibited works convey the extraordinary development of architecture in the first two decades after the October Revolution. The transformational processes in the society created new architectural ideas emanating from established architects and young graduates of new schools. 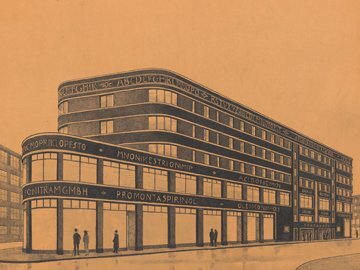 The about 50 exhibited drawings illustrate the innovative approaches by the Russian architects between 1920 and 1940, which through its designs and graphic techniques impress with their variety. The exhibition Drawing Ambience. Alvin Boyarsky and the Architectural Association presents around 50 masterworks of contemporary architectural drawings penned by celebrated architects and assembled by the long-term chairman of the Architectural Association School of Architecture (AA) in London, Alvin Boyarsky. The exhibition has already been on show at the Mildred Lane Kemper Art Museum at the Washington University in St. Louis, at the Museum of Art, Rhode Island School of Design in Providence, and at the Cooper Union in New York and is now coming to Berlin. The AA is justifiably considered the most important melting pot of architectural talent and has produced many Stirling and Pritzker prize winners. The renowned alumni of the school include Rem Koolhaas, Zaha Hadid, Nigel Coates, David Chipperfield, Ben van Berkel and Will Alsop. 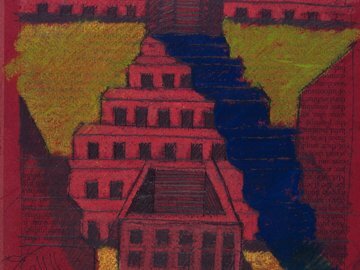 Drawing Ambience: Alvin Boyarsky and the Architectural Association is coorganized by the Mildred Lane Kemper Art Museum at Washington University in St. Louis and the Museum of Art, Rhode Island School of Design, Providence. It is cocurated by Igor Marjanović and Jan Howard. RIM. Media partner: tip Berlin. Concurrently with the Berlin Projects. Architectural Drawings 1920–1990 exhibition, VeloNotte will take place on 24th of June 2017 in Berlin. An architectural & musical tour of Europe’s liveliest city in its evolution, a ride to re-link visions of the small town Berlin in times of the Grosser Kurfürst with places where immigrants enjoyed a monopoly in brewing coffee and distilling brandy, Berlin as an expressionist tale in the 1920’s, or a just the place to reinvent themselves – like it was for David Bowie and Iggy Pop. Please join us for four hours of a relaxed, 21 km nocturnal cycling tour together with friends from all over the world with a shared passion for cycling, history & music! With leading historians like Tim Blanning, David Clay Large und Martin Düspohl to tell you stories. The rally starts at the Museum for Architectural Drawing from 8 pm, and the bike tour starts at 9 pm. The event is in English and costs 10 Euros. Velonotte ticket gives free admission to exhibition Berlin Projects. Architectural Drawings 1920–1990. The exhibition Peter Cook. 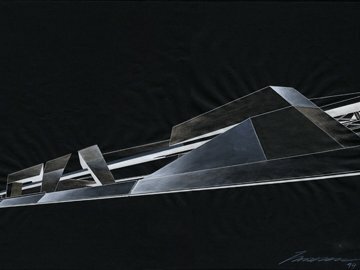 Retrospective is devoted to drawings by the famous British architect who is celebrating his 80th birthday this year. Peter Cook is without doubt one of the leading figures of the Archigram group and in 2007 was knighted for his contribution to architecture. 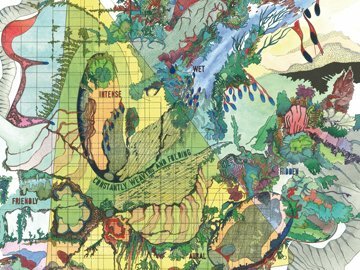 The exhibition shows a range of his drawings: from Archigram to CRAB, from 1968 to 2016, from Plug-In City to Hidden City. 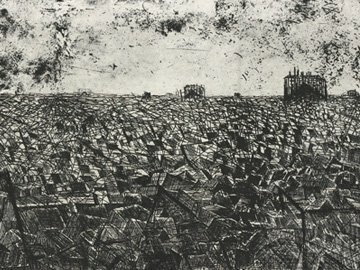 Some of his drawings are based on actual projects, such the urban planning development for Frankfurt-Oberrad in 1986, Real City: Frankfurt (which remained unrealised); many are rather experiments and utopias, such as Arcadia, Vegetated Lump and Hidden City, where the architecture was inspired by the surrounding vegetation, its beginning and end blurred, merging organically into nature. A catalogue has been published. The exhibition ‘Anime Architecture’ presents original drawings from famous Japanese animation films. The show focuses on virtuosic renderings of urban architecture. 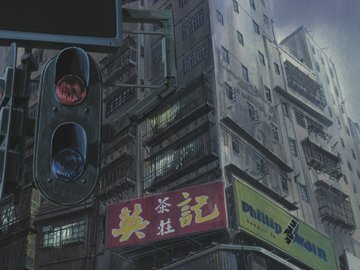 In drawings made for the films Patlabor (1989), Ghost in the Shell (1995) and Innocence (2004), the megalopolis skyline is seen to be crushing in on what remains of traditional wooden housing. Industrial sites with endless labyrinths of cables and piping and utopian science-fiction constructions form backdrops for the dynamic film plots. The exhibition shows work by Hiromasa Ogura (art director), Mamoru Oshii (director), Atsushi Takeuchi (layout) and Takashi Watabe (layout). Image: © 1995 Shirow Masamune / Kodansha ∙ Bandai Visual ∙ Manga Entertainment Ltd. The exhibition is a joint project of the Tchoban Foundation with the Istituto Centrale per la Grafica in Rome and the State Tretyakov Gallery in Moscow. It is dedicated to Italy in European and Russian drawing from the 18th to the beginning of the 21st century. The selection of works from three collections illustrates the emergence of Italy as an inspiration for generations of artists. 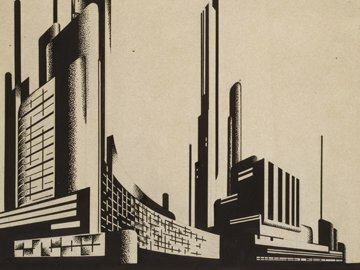 The exhibition focuses on Italian architecture that greatly influenced the genre of the architectural drawing; one which concentrates on the distinctive characteristics of cities and buildings, creating unique graphic representations of real and imagined spaces. The exhibition illustrates that Italy has been fascinating over centuries and still remains a great influence for draftsmen today. The wonderful graphic collection of Vienna’s renowned museum, the Albertina, ranks as one of the most important worldwide. It covers more than 50,000 hand drawn drawings and 900,000 printed graphics ranging from the late gothic period to the contemporary, including works by Leonardo, Michelangelo, Raffael, Albrecht Dürer, Peter Paul Rubens, Rembrandt, Manet and Picasso. The Albertina’s architectural collection is no less important, including more than 35,000 works by acclaimed architects from the 16th century up to the present day. The exhibition at the Museum for Architectural Drawing offers an insight into this magnificent collection through a broad spectrum of hand drawn architecture: sketches, drafts, vedute and projects of renowned artists such as Antonio Pisanello, Gian Lorenzo Bernini, Francesco Borromini, Hubert Robert, Adolf Loos, Egon Schiele, Frank Lloyd Wright, Hans Hollein and Zaha Hadid. Important architectural drawings held by Sir John Soane’s Museum, one of the most significant collections of its kind in Great Britain, will form a new temporary exhibition at the Museum for Architectural Drawing in Berlin. 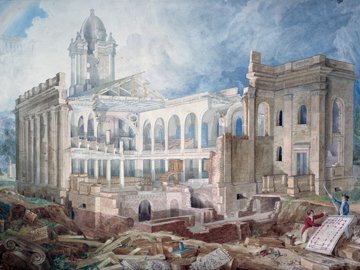 The exhibition illustrates the ambition of leading British architects of the late 18th century who strove to create new architecture in the Classical tradition that could compete – in terms of public works, private houses, mausolea, interior detail and even furnishings - with the glories of the Ancient World. Illustrating this central theme, some of the finest drawings and designs by Sir John Soane, Robert Adam, George Dance the Younger, Sir William Chambers and James Wyatt will be shown for the first time in Germany. 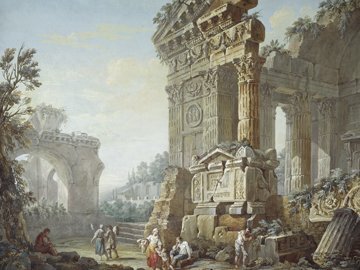 In Pursuit of Antiquity will focus on Ancient Rome and its great monuments as a source of inspiration to the architectural students of the 18th and 19th centuries who studied and drew these structures as part of their education. The exhibition will also explore the idea of an architectural drawing – from sketch to final presentation. Drawings by French and Italian artists such as Percier, Clérisseau and the great Piranesi, all represented in Soane’s collection, will illustrate the links between these architects and British architects. Unique in the world, Berlin’s new Museum for Architectural Drawing, designed by architects Sergei Tchoban and Sergey Kuznetsov, brings some of the finest 20th and 21st century architectural drawings together in a building provocatively tattooed with its own drawings. This exhibition at Cornell University showcases the collection – many pieces never before exhibited in the United States – and the development of the museum itself. The Hartell Gallery portion of the exhibition, Legacy, features iconic drawings of Soviet and Russian architects including those of Yakov Chernikov, Boris Iofan, Andrey Burov, Alexey Shusev, and Boris Zhuravlev. Work of contemporary Russian architects influenced by these earlier figures is represented with drawings by Alexander Brodsky and Arthur Skizhali-Weiss. Treasury, in the Bibliowicz Gallery, highlights the wider international collection of the museum with sketches and drawings by Hans Poelzig, Aldo Rossi, Alvaro Siza, Peter Wilson, and Madelon Vriesendorp, cofounder of OMA. The exhibition presents the hand-drawn worlds of prominent American architects and architectural draftsmen of the 20th and 21st century. The art of architectural representation in the USA, particularly at the beginning of the 20th century, reached heights of originality and perfection which still stand out today. The diversity of techniques used by the American draftsmen is remarkable. Examples from competition entries and designs for realised buildings by Frank Lloyd Wright, Richard Neutra, Michael Graves, Schultze & Weaver and architectural fantasies by Hugh Ferriss and Achilles Rizzoli, show the influence which drawing style can have on formulating architectonic ideas and demonstrate the role which artistic expression plays on architectural presentation. Architectural illustration has been particularly recognised from the 1980s to the present day in the United States: in the second half of the 1980s, leading architectural draftsmen founded the American Society of Architectural Perspectivists (today the American Society of Architectural Illustrators ASAI). The society runs the annual Hugh Ferriss Memorial Prize for Architectural Drawing. 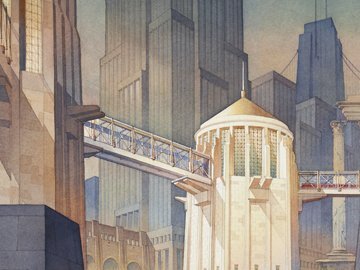 Now, the Tchoban Foundation presents exceptional works by contemporary architectural draftsmen, including Hugh Ferriss prize winners, Thomas Schaller, Paul Stevenson Oles and Gilbert Gorski. Also on view are works by Richard Ferrier, Steven Quevedo, James Wines, Scott Tulay, Gary Schuberth and Michael Sorkin, similarly renowned for their unmistakable drawing styles in the USA and beyond. The exhibited works stem from private collections or are on loan from the artists themselves. The exhibition at the Museum for Architectural Drawing shows the work of Alexander Brodsky, a contemporary Russian artist and architect of international acclaim. Alexander Brodsky comes from a renowned family of artists in Moscow and is credited as one of the groundbreaking co-founders of the ‘paper architecture’ movement in the Soviet Union in the early 1980s. It’s aim was to revolutionise the norms of late-modernist architectural production. Today he is known across the globe for his fantastic utopian architectural worlds which have been shown and premiated in numerous exhibitions from Tokyo and Paris to New York as well as at the 2006 Architecture Biennale in Venice. The exhibition, which includes a number of new works made especially for Berlin, offers an overview of the creative output both of Brodsky the artist and Brodsky the architect. It gives insight into the rich variety of techniques. The Tchoban Foundation will be showing around 60 hand-drawn views, sections and groundplans of Hôtels particuliers which were built in Paris in the first half of the 18th century. They illuminate one of the most well-known characteristics of Parisian architecture which even today defines the French capital internationally. These town houses were built by the most celebrated architects of the time, foremost by Germain Boffrand und Jules Hardouin-Mansart, commissioned by French nobility. Today, primarily ministries and embassies reside in these buildings. The drawings from the École des Beaux-Arts’ repository are designs for the printing plates for L’Architecture françoise, three volumes published by Jean Mariette between 1727 and 1732. The aim of these books was to show Europe how France excelled in the field of architecture. In order to realise this enterprise, Mariette commissioned young architectural draftsmen, including Jean Michel Chevotet und Pierre-Charles Prévotel, to render perspectives which accurately express the spirit of invention and the daring construction and decoration of each building. 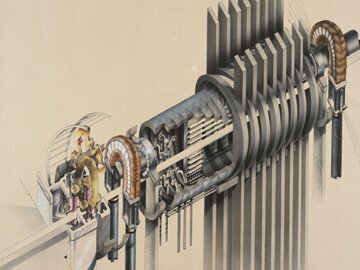 The Museum for Architectural Drawing presents Lebbeus Woods. ON-LINE, an exhibition of the finest works of architectural theorist, draftsman, educator and architect, Lebbeus Woods (1940–2012). The show focuses on the intensely rendered architectural and urban environments produced early on in Woods’ career. These ink and pencil drawings cover a wide range of Woods’ research and re-imagination of cities both real and fictive and support his longstanding desire to show the capacity of architecture as a transformative and eloquent force. The exhibition in the State Tretyakov gallery is a joint project with the Tchoban Foundation. It is dedicated to the theme of Italy in European and Russian drawing from the 18th to the beginning of the 21st century. Works selected from both collections demonstrate the emergence of the image of Italy and its development over time. 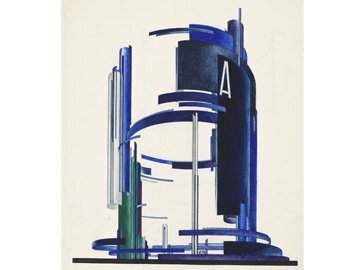 The exhibition focuses on Italian architecture which has provoked a particular genre of architectural drawing; one which concentrates on the distinctive characteristics of cities and buildings, creating unique graphic representations of real and imagined spaces. Italy has been a subject of great importance for architectural drawing over centuries and remains a great influence for draftsmen today. The exhibition begins with works from the second half of the 18th century as architectural drawing discovered the Italian theme and concludes with drawings by contemporary artists. 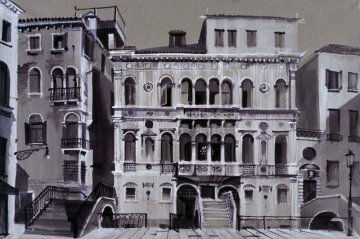 On show are works by architects and graphic artists such as Giovanni Battista Piranesi, Hubert Robert, Vasili Bazhenov, Alexandre Benois, Sergej Kuznetsov, Michail Filippov and Sergei Tchoban. Following the successful exhibition ‘Pirenesi’s Paestum’ and ‘Architecture in Cultural Strife’, the exhibition of the new acquisitions of the Tchoban Foundation focuses on contemporary architectural drawing. Included on show are works by Oskar Niemeyer, David Chipperfield, Zaha Hadid, Aldo Rossi and the only German Pritzker prize winner until now, Gottfried Böhm. The large format drawings of the Japanese architectural office Bow-Wow from the BMW-Guggenheim Lab Project in New York, 2011, are particularly unusual. 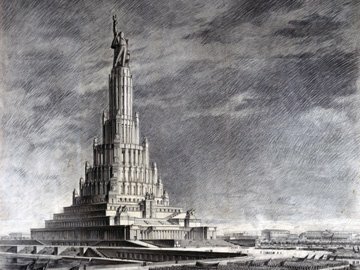 This exhibition again contains a selection of Russian works on paper, for example Artur Skizhali-Veis’s architectural fantasies, designs by the main architect of the Olympic site in Sochi, Oleg Kharchenko, for the winter Olympics 2014, as well as architectural graphics by Alexander Brodsky. Alongside recent acquisitions, the Tchoban Foundation is particularly pleased to present to the public, a number of drawings which have been donated as gifts to the trust. The history of Russian architecture in the first half of the twentieth century is riddled with contradictions. This is already evident in its origins. Whilst avant-garde Constructivism, radically daring even today, was mainly rooted in Moscow, the defenders of Neoclassicism were bound to the traditional architecture of St. Petersburg. Yet both currents strove to represent the architecture of the Revolution. As the two schools crossed paths in the 1920s, a widening rift revealed not only artistic but ideological differences. Neoclassicism was adopted by the Bolsheviks to embody their cultural agenda and was established during the following decades as the leading national style of the Soviet Union. The modernist current, in contrast, was drastically marginalised or at best, combined in a kind of synthesis comparable to western Art Déco. 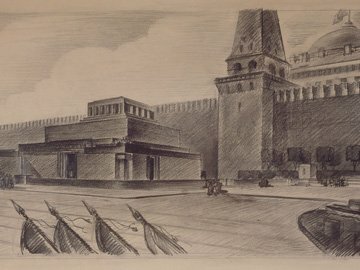 The exhibition comprising the extensive Sergei Tchoban Collection of architectural drawings, throws light on the ideological and artistic conflict between the two main architectural styles from the turn of the century to Stalin’s death in 1953. Selected examples offer a view on the fraught arena between tradition and progress, art and technology, history and contemporary visions and not least on the cultural competition between the two Russian cities, Leningrad/ St. Petersburg and Moscow. Admission is 5 Euros, discounted 3 Euros. In the first of a series of collaborations, Sir John Soane’s Museum (the first museum of architecture in the world) is showing a selection of the highlights from the newest architectural museum in Europe - Berlin’s Tchoban Foundation, Museum for Architectural Drawing. 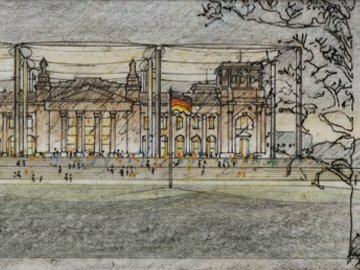 The exhibition will focus on works by architects rarely-seen in British collections, mainly by German and Russian draughtsmen, emphasising the strong cultural and historical links between these two countries. Included in the exhibition will be the drawings by Karl Friedrich Schinkel, Matthias Daniel Pöppelmann, Leo von Klenze and Herman Geisler. The architectural drawing in Russia is illustrated by the works of Vincenzo Brenna, Giacomo Quarenghi, Eduard Gaertner, Andrey Burov and Boris Iofan. In addition, contemporary drawings by Sergei Tchoban will complement and contrast with the works by great draughtsmen of past centuries. Duration: 21.06. – 28.09.2013. Opening hours are Tuesday to Saturday; 10-5 pm. Admission is free. (in English, 48 pages, price: 10,00 Euros plus shipping). 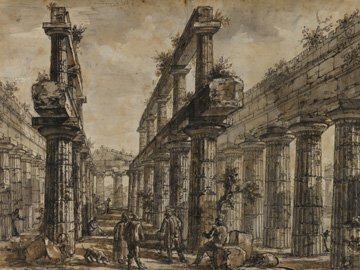 The Museum for Architectural Drawing opens its programme with ‘Piranesi’s Paestum: Master Drawings Uncovered’. In presenting this singular collection from the Sir John Soane‘s Museum in London, one of the oldest architectural museums in the world, the Museum for Architectural Drawing marks its intention to continue this tradition. For the first time ever, fifteen drawings from Pirenesi’s ‘Paestum Cycle’ will be shown outside of London. The Paestum drawings were the preparatory work for Piranesi’s Différentes Vues de Pesto, finished by his son Francesco and published posthumously in 1778. They depict views of the three great Doric temples in the former Greek colony of Poseidonia, colonised by the Romans in the late sixth century BC and re-named Paestum. (in English, 120 pages, price: 25,00 Euros plus shipping).